Conservation prioritization using integer programming techniques. To solve large-scale problems, users should install the 'gurobi' optimizer (available from < http://www.gurobi.com/>). The prioritizr R package uses integer linear programming (ILP) techniques to provide a flexible interface for building and solving conservation planning problems. It supports a broad range of objectives, constraints, and penalties that can be used to custom-tailor conservation planning problems to the specific needs of a conservation planning exercise. Once built, conservation planning problems can be solved using a variety of commercial and open-source exact algorithm solvers. In contrast to the algorithms conventionally used to solve conservation problems, such as heuristics or simulated annealing, the exact algorithms used here are guaranteed to find optimal solutions. Furthermore, conservation problems can be constructed to optimize the spatial allocation of different management actions or zones, meaning that conservation practitioners can identify solutions that benefit multiple stakeholders. Finally, this package has the functionality to read input data formatted for the Marxan conservation planning program, and find much cheaper solutions in a much shorter period of time than Marxan. The latest official version of the prioritizr R package can be installed using the following R code. Alternatively, the latest development version can be installed using the following code. Please note that while developmental versions may contain additional features not present in the official version, they may also contain coding errors. Hanson JO, Schuster R, Morrell N, Strimas-Mackey M, Watts ME, Arcese P, Bennett J, Possingham HP (2018). prioritizr: Systematic Conservation Prioritization in R. R package version 4.0.0.12. Available at https://github.com/prioritizr/prioritizr. Additionally, we keep a record of publications that use the prioritizr R package. If you use this package in any reports or publications, please file an issue on GitHub so we can add it to the record. Here we will provide a short example showing how the prioritizr R package can be used to build and solve conservation problems. For brevity, we will use one of the built-in simulated data sets that is distributed with the package. First, we will load the prioritizr R package. We will use the sim_pu_polygons object to represent our planning units. Although the prioritizr R can support many different types of planning unit data, here our planning units are represented as polygons in a spatial vector format (i.e. SpatialPolygonsDataFrame). Each polygon represents a different planning unit and we have 90 planning units in total. 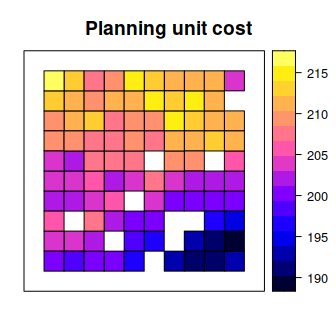 The attribute table associated with this data set contains information describing the acquisition cost of each planning ("cost" column), and a value indicating if the unit is already located in protected area ("locked_in" column). Let's explore the planning unit data. Conservation features are represented using a stack of raster data (i.e. RasterStack objects). A RasterStack represents a collection of RasterLayers with the same spatial properties (i.e. spatial extent, coordinate system, dimensionality, and resolution). Each RasterLayer in the stack describes the distribution of a conservation feature. In our example, the sim_features object is a RasterStack object that contains 5 layers. Each RasterLayer describes the distribution of a species. Specifically, the pixel values denote the proportion of suitable habitat across different areas inside the study area. For a given layer, pixels with a value of one are comprised entirely of suitable habitat for the feature, and pixels with a value of zero contain no suitable habitat. Let's say that we want to develop a reserve network that will secure 20 % of the distribution for each feature in the study area for minimal cost. In this planning scenario, we can either purchase all of the land inside a given planning unit, or none of the land inside a given planning unit. Thus we will create a new problem that will use a minimum set objective (add_min_set_objective), with relative targets of 20 % (add_relative_targets), and binary decisions (add_binary_decisions). Although this solution adequately conserves each feature, it is inefficient because it does not consider the fact some of the planning units are already inside protected areas. Since our planning unit data contains information on which planning units are already inside protected areas (in the "locked_in" column of the attribute table), we can add constraints to ensure they are prioritized in the solution (add_locked_in_constraints). This solution is an improvement over the previous solution. However, it is also highly fragmented. As a consequence, this solution may be associated with increased management costs and the species in this scenario may not benefit substantially from this solution due to edge effects. We can further modify the problem by adding penalties that punish overly fragmented solutions (add_boundary_penalties). Here we will use a penalty factor of 1 (i.e. boundary length modifier; BLM), and an edge factor of 50 % so that planning units that occur outer edge of the study area are not overly penalized. This solution is even better then the previous solution. However, we are not finished yet. This solution does not maintain connectivity between reserves, and so species may have limited capacity to disperse throughout the solution. To avoid this, we can add contiguity constraints (add_contiguity_constraints). This short example demonstrates how the prioritizr R package can be used to build a minimal conservation problem, and how constraints and penalties can be iteratively added to the problem to obtain a solution. Although we explored just a few different functions for modifying the a conservation problem, the prioritizr R package provides many functions for specifying objectives, constraints, penalties, and decision variables, so that you can build and custom-tailor a conservation planning problem to suit your exact planning scenario. Please refer to the package website for more information on the prioritizr R package. This website contains a comprehensive tutorial on systematic conservation planning using the package, instructions for installing the Gurobi software suite to solve large-scale and complex conservation planning problems, a tutorial on building and solving problems that contain multiple management zones, and two worked examples involving real-world data in Tasmania, Australia and Salt Spring Island, Canada. Additionally, check out the teaching repository for seminar slides and workshop materials. If you have any questions about using the prioritizr R package or suggestions from improving it, please file an issue at the package's online code repository.